I Love mid week vacations and getting off strip from our daily busy lives ! The pictures are from my recent trip to Lansdowne, a small coveted hill station in Garhwal ! It is the quietest Hill station of India and is popular since Britishers ruled our country(more on that in the next post) !!! Decided to give a new lease of life to my Peplum top as if it was just waiting to show up and begging for its turn. Its been a year that I haven't touched this beautiful crochet one and last first time I wore it was with a pencil skirt ! Enter My Giveaway and Win yourself a fabulous pair of handcrafted earrings By Precious You . JOIN ME ON INSTAGRAM TO SEE WHAT FUN I AM UPTO !! Love the color of the bag...and the view from the room is really beautiful! Love the photos you look pretty the sunglasses my favorites !! Visit http://www.urbanfashionstylee.blogspot.mx and check my new post!! love ur sunglasses..n the peplum top is cute. Very beautiful bag dear ! Such a beautiful place!! Have to plan a visit next time when I am in India! Love the lace details on the top! Hope you are having a wonderful day! Love the contrast of the turquoise clutch with the lilac leggings!! I like it and that top looks great. Have a nice day. You look gorgeous! Love the lace detail on the top and the sunglasses. Love your glasses and your skirt. Oh i really love your sunglasses and your Top, great combination! i be happy when you do the same! Well done, I enjoyed your post a lot! Never heard about landsdowne until now. Interesting place. I love short getaways too! 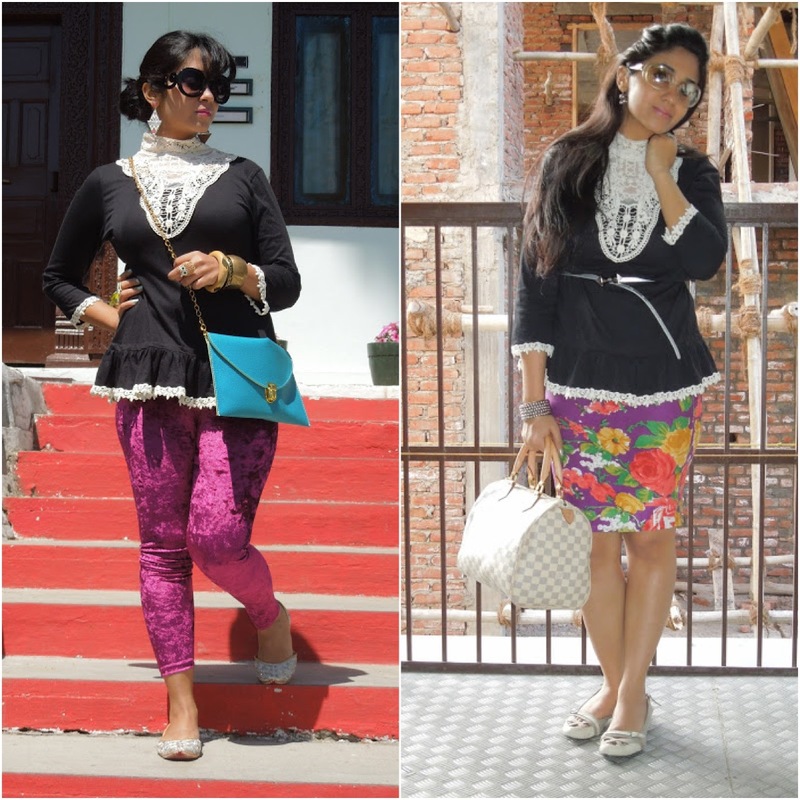 love the lace on your peplum top, it's such a classic :) you look great! Great shirt!! You look beautiful! sorry for the delay in returning to you !! OMGGGG that peplum top is super gorgeous!!! Gorgeous!! i love your top and clutch! Lovely blouse! And thanks for leaving such a sweet comment! more of your useful info. Thanks for the post. I'll certainly return. I love how you wear your top with that lovely floral skirt! Glad you were able to spend some time off!! I love the color of this bag and all of the lace details - VERY pretty! If you want we can follow each other here, on bloglovin or GFC ? I love that peplum top!! Love the photos, amazing outfit im in love with your pants!! nice photo:)Maybe we follow each other !? I love mid week vacations too! You look incredible in this peplum top and the crushed velvet pants are so cool!